Mill Hill Perforated needlework paper in 14 count. Perfect for Gift Tags, Christmas Ornaments, Wedding and Birth Announcements, Bookmarks and many other needlework projects. 2x sheets of 9" x 12" per pack. 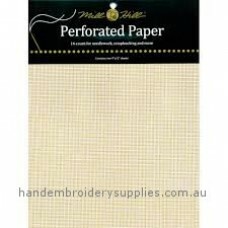 For Needlecraft and Scrapbooking, each pack contains 2 sheets of 14 count perforated paper - 23cm x ..